In a rural, backcountry shelter in the town of Middle, Georgia, two chihuahua’s hang onto each other for dear life, frightened by the prospects of a new uncertain future. The shelter, which incredibly does not go by any official name, says the two pups were dumped there mercilessly by an owner who no longer could afford to care for them. According to an anonymous source who works at the shelter who spoke exclusively to me, the two dogs are a bonded pair, who are absolutely terrified by the noise, and chaos of their new environments. They have not eaten any food, and are so terrified that they can be found most of their days consoling each other in a tight grip. In fact, rescuers say that the two have not let go of each other for volunteers to inspect them, and so both genders of the two pups are undetermined at this time. SpeakUp, if you or someone you know is interested in giving these two precious pups the homes they deserve, please e-mail Charli at cstinson@pstel.net. Additionally, please share this story on Facebook or Twitter, so we are closer to finding them the forever family they rightfully deserve. We have done it before and can certainly do it again. 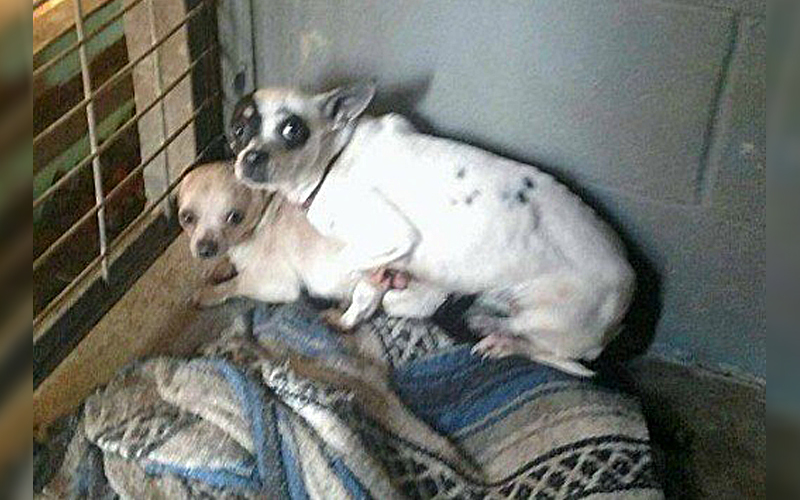 1 Response to "Two Forgotten Chihuahua’s Terrified at Kill Shelter, Hold Onto Each Other For Comfort"
I TRIED TO E-MAIL TO GIVE THEM A HOME, BUT THE E-MAIL BOUNCED, I AM IN COSTA RICA, IF ANYONE CAN GET THEM OUT AND SEND THEM, I HAVE A GREAT HOME FOR THEM!